So you want to start collaging but you aren't sure where to start! Don't worry, I've got you covered. Those who follow me on Instagram know I do a lot of digital collages, however my journey started with the traditional analogue (a.k.a. hand cut) collage technique. I didn't use a guide and learnt a lot along the way, this blog post is a shortcut to help you master analogue collage. In order to start analogue collage you will need the following: A3 cutting board, exacto, scissors, glue, a visual diary and material to use (like magazines, posters and etc). All in all it will cost you around $150 - $200 depending on where you buy and how invested you are in the beginning. You can find all the items apart from materials at your local art store and even at discount dollar stores. Remember when handling the exacto that it is not a toy, you need to be really careful with this item. It is super sharp and you can do damage to yourself when you are using it in the incorrect way. Never cut anything facing towards you or on your legs, make sure you are cutting things on the cutting board on a hard surface like a desk or table. If you are under 18, always make sure a parent or guardian is supervising you while you use the exacto. It can cause serious cuts if you are using it incorrectly and I cannot stress that enough! I have seen girls in art class at high school cut themselves and end up in hospital. The visual diary is a great way to collect all of your creations and keep them safe! An acid free diary is perfect as the works won't be damaged by the paper that you are placing them on. I have several visual diaries in different sizes from A5, A4, A3, A2 and A1. I like to customise my diaries with stickers and make them really cute and all mine so they never get lost or left behind at friends studios or long haul trips. I have covered this topic before in a previous blog post that you can read here. I recommend going to your local antique store or charity shop first to see what vintage materials they have. You can use anything from books, magazines, cd covers, dyed paper, posters and etc. The list really does go on, remember to keep your eyes and mind open to new and amazing materials that you can potentially add into your works. Make friends with the staff at these stores and give them your number so they call you when new items come in - you might miss out if someone else gets them before you! I struck gold when walking around New York! I found heaps of posters on the side of the road next to a bin. Talk about right place, right time. You can definitely use the standard glue like UHU and other brands but those glues can have acids in them that can yellow the paper over time and be weak in terms of keeping the paper stuck together over a long period of time. I recommend using acid free glue. Ensuring the that the glue is acid free means that that it will not yellow over time and will have more strength! Medium gloss can also be a great substitute for glue, it is a great binding agent but just make sure it is acid free when you purchase it. 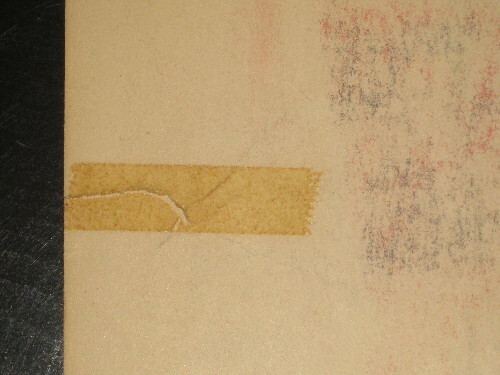 Yellowing on paper caused by non acid free adhesive tape. There are thousands of fantastic contemporary artists on Instagram and Pinterest that you can research. If you want some art history I have written a blog post about my Top 5 Artist's Who Used Collage and it is a great starting point for research. You can search collage artists on Pinterest and I love seeing what people are creating and who's doing what! Remember that some people have certain styles that they keep as their own and they don't venture to far from that style, but I definitely think it's important to incorporate everything that you love from a particular style and make it your own. When you feel like you are ready to transition from the visual diary to something new, you can always apply it to canvas. Medium gloss is great for this type of base! This allows you to use new materials like paint and other things such as embroidery. The sky is the limit when you want to change it up! Good luck + I hope all of this information helps your new journey in the world of collage!